This menu will delight all your hungry goblins, no matter what age! To create these pumpkin faced burgers, all you need is a regular hamburger patty, buns, slices of American Cheese and a sharp knife. Using a sharp knife, carve eyes, nose and mouth out of each cheese slice. Be careful to keep the design close to the center of the slice because the cheese will spread when it melts. Once burgers are cooked, wait until just before serving to add cheese slice. The cheese melts quickly on the hot burger, so you have to be careful not to add it too soon, or you'll lose the effect. Serve burgers open faced and allow people to add their own condiments once they've gotten a good look. In a small bowl, whisk mayonnaise, sugar and vinegar. Cover and refrigerate for at least 2 hours. In a large bowl, combine remaining ingredients. Add dressing and toss to coat. Cover and refrigerate one hour. Can be made a day ahead. 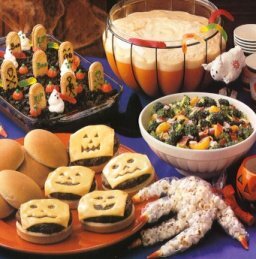 To keep with the theme, add some fake plastic spiders to the mix, or use as a garnish on each serving. But if your goblins are quite small, you may want to just decorate the table with the spiders rather than adding them to the salad. Combine sherbert and pineapple juice in a punch bowl; stir well. Add soda; stir until sherbert is almost dissolved. Decorate bowl with gummy worms (and add a worm to each cup) and serve immediately. In a mixing bowl, combine flour, sugar, baking soda and salt; set aside. In a saucepan, combine butter, water and cocoa; bring to a boil over medium heat. Add to flour mixture; beat well. Beat in sour cream and eggs. Pour into a greased 13x9x2 inch baking pan. Bake at 350º for 35-38 minutes or until a toothpick inserted near the center comes out clean. Cool on a wire rack for 5 minutes. Meanwhile, in a saucepan, combine butter, milk and cocoa; bring to a boil. Remove from heat; stir in sugar and vanilla. Pour over warm cake. Crumble chocolate cookies and sprinkle over frosting while still warm. Cool completely. For tombstones, use icing to decorate vanilla cookies with words or faces; press one end of cookies into cake so they stand up like tombstones. For ghosts, make mounds of whipped topping; use icing to add eyes and mouths as desired. Refrigerate for at least one hour. Add pumpkins and gummy worms just before serving. As an additional decoration for each place setting, place one piece of candy corn in the tip of each finger of a disposable, clear plastic glove (can be found in hardware stores) and fill glove with popcorn. Tie glove closed at wrist. Many thanks to Vicki Schlechter and Taste of Home magazine for this wonderful theme idea!